One Gleissberg cycle consists of seven consecutive sunspot cycles. Its average length is 77.5 years, max length 83.0 years and min length 72.0 years. A Double Gleissberg Cycle might explain the 162 year Mongul Empire narrative. The Mongol Empire emerged from the unification of several nomadic tribes in the Mongol homeland under the leadership of Genghis Khan, whom a council proclaimed ruler of all the Mongols in 1206. Increasingly isolated from their subjects, the Mongols quickly lost most of China to the rebellious Ming forces and in 1368 fled to their heartland in Mongolia. The Mongol Empire expansion begins with the appearance of Fiery Dragons in the sky. 1222 … Fiery Dragons were seen in the Air, flying and fighting. The demise of the Mongol Empire is also marked by the appearance of Fiery Dragons. The gradualist Mongol Empire narrative includes a remarkable climate change storyline that transforms the climate of Central Asia from mild and wet to cold and parched. During the rise of the Mongol Empire in the 13th century, the usually cold, parched steppes of Central Asia enjoyed their mildest, wettest conditions in more than a millennium. It is thought that this resulted in a rapid increase in the number of war horses and other livestock which significantly enhanced Mongol military strength. 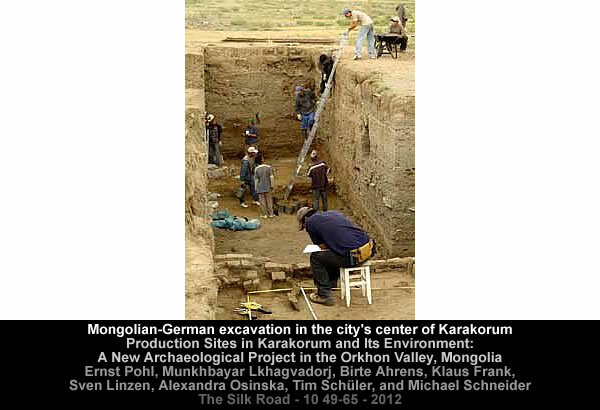 A catastrophist interpretation suggests the climate change in Central Asia was caused by the collision and suturing together of the European and Asian landmasses. The newly formed Eurasian landmass provided a Western escape route for the Mongols to flee their [now] cold and parched homelands. 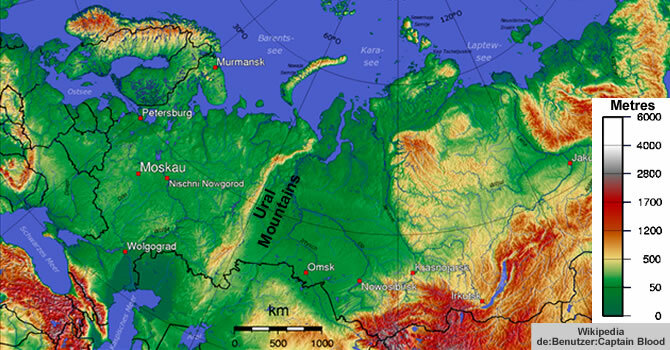 The Ural Mountains, or simply the Urals, are a mountain range that runs approximately from north to south through western Russia, from the coast of the Arctic Ocean to the Ural River and northwestern Kazakhstan. The mountain range forms part of the conventional boundary between the continents of Europe and Asia. Vaygach Island and the islands of Novaya Zemlya form a further continuation of the chain to the north into the Arctic Ocean. Unlike the other major orogens of the Paleozoic (Appalachians, Caledonides, Variscides), the Urals have not undergone post-orogenic extensional collapse and are unusually well preserved for their age, being underlaid by a pronounced crustal root. The collapse of the Mongol Empire left the Ming Dynasty ruling China. The Ming dynasty was the ruling dynasty of China – then known as the Great Ming Empire – for 276 years (1368–1644) following the collapse of the Mongol-led Yuan dynasty. Unsurprisingly, the astrology of the Ming Dynasty involved sunspots and auroras. Overall, the records confirm the Sun was notably active between the 1350s and the 1380s. Records of observations of sunspots and auroras in pre-telescopic historical documents provide useful information about past solar activity both in long-term trends and short-term space weather events. 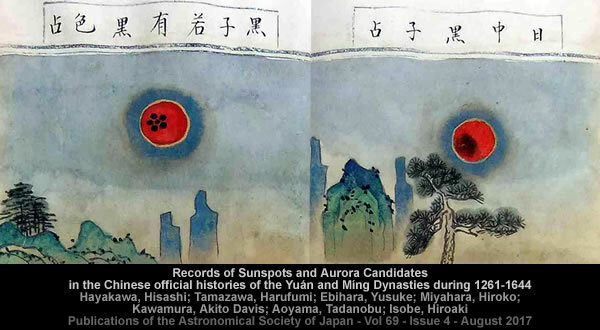 In this study, we present the results of a comprehensive survey of the records of sunspots and aurora candidates in the Yuánshǐ and Míngshǐ, Chinese Official Histories spanning 1261-1368 and 1368-1644, based on continuous observations with well-formatted reports conducted by contemporary professional astronomers. We then provide a brief comparison of these data with Total Solar Irradiance (TSI) as an indicator of the solar activity during the corresponding periods to show significant active phases between 1350s-80s and 1610s-30s. A closer examination suggests the period of solar turbulence may have begun in the 1340s. Since the 1340s the Mongol-led Yuan dynasty experienced problems. The Yellow River flooded constantly, and other natural disasters also occurred. At the same time the Yuan dynasty required considerable military expenditure to maintain its vast empire. 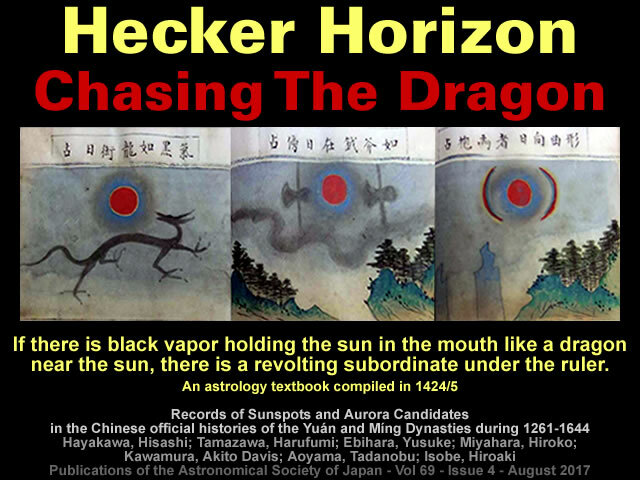 The Hecker Horizon between 1300 and 1400 CE was a period of significant terrestrial turmoil and spectacular solar activity that represents a step change that ushered in a more stable epoch in which gradualism would [eventually] flourish. But, as always, readers should evaluate the evidence and draw their own conclusions. 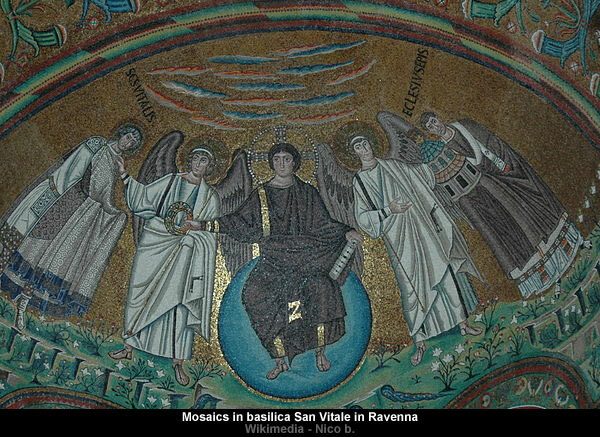 The Ming imagery of a deep red Sun surrounded by a distinctly blue halo suggests the observational inspiration for the Ravenna Blue Sun mosaic might have occurred in the 14th century. The theophany was begun in 525 under bishop Ecclesius. It has a great gold fascia with twining flowers, birds, and horns of plenty. Jesus Christ appears, seated on a blue globe in the summit of the vault, robed in purple, with his right hand offering the martyr’s crown to Saint Vitale. On the left, Bishop Ecclesius offers a model of the church. Gallery | This entry was posted in Catastrophism, Geology, Hecker Horizon, History, Solar System. Bookmark the permalink. The appearance of the Chinese in Italy, following Gavin Menzies’ ideas, and from his two books 1421, 1434, leaves me with the impression that the Ming Chinese were navigating the globe to re-establish astronomical data as a result of some change in the Earth’s celestial geometry. That the Ming seagoing junks were also enormous, suggests those peoples are better placed in a megalithic and megafauna era, and given that some medieval palaces and constructions were also large, leads to the idea that this period of catastophe marked the end of the megafauna/lithic period, associated with an increase in gravity, which the biosphere then adpated by forming smaller variants of the existing taxa. Which implies the LIA was the Pleistocene event ???? The original crust of the Earth was pulled into the Tibetan Plateau by the explosion of that area into the Moon, after the expulsion from the star. The island chains in the Pacific can show the original position of that crust. That which did not reach orbital velocity fell back to Earth. An Earth that continued to expand, rapidly, with some local contraction near Tibet, due to overexpansion there, being filled in by further, outer, expansion. After that, came the birth of Venus and the events of Exodus and Santorini. What is uncertain is the timing of these events. Is it correct, Tim, that you say that the birth of Venus, responsible for much orogenesis in America etc., was less than 700 years ago? There is evidence to support a recent “big bang” that created a lot of debris. The orbital stability of Venus suggests it wasn’t produced in that recent “big bang”. History has many Comet sightings… putting a name to these Comets is a challenge. 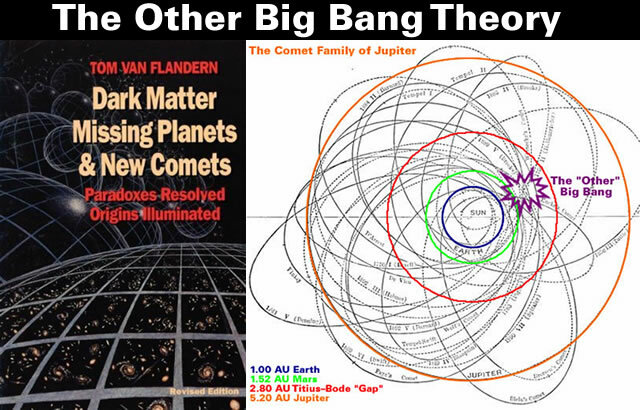 It is very difficult to substantiate the “Comet Venus” conjecture. It is very difficult to substantiate the “explosion of that area into the Moon” conjecture. The Hecker Horizon looks like it was a Downsizing Event. I first heard about the “Gleissberg Cycle” from this guy at the Diehold Foundation – and my question is why seven solar cycles and not 6, or 8 or 17 or 42.5? What is special about seven cycles? Also – perhaps due to childhood indoctrination of one going blind if you look at the sun – how were pre-telescopic people able to “see” the sun spots and/or increased solar activity to account for active and inactive periods? a) Around the time of Sunset and/or Sunrise. b) The colours suggest the brightness of the Sun was attenuated by dust and/or smoke. c) The sun spots were very big. I hopped across to the Diehold Foundation on Youtube and started to watch “The Secret of the Universe Finding the Clock Cycles, Series 1, Part 2/7” video. At 1:38 the video start discussing the unexplained gradualist “Ice Age” narrative which is one of the foundational elements of the gradualist chronology narrative. The video narrative then moves on to an Ice Field over Seattle that became 4,000 feet thick over a period of less than 40 years. This depth of ice is said to produce a pressure of 105 tones per square foot. It seems this pressure is used to explain away the “hard pan” that’s found 4 to 6 feet down. The “hard pan” is said to have “looked like asphalt. It was even hard for the backhoe to break through it”. Unfortunately, the video doesn’t appear to address whether this “hard pan” that “looked like asphalt” actually contains hydro-carbons or [say] just burnt material. And within the context of the video presentation the depth of ice might explain why the “hard pan” is hard BUT it doesn’t explain why it “looked like asphalt”. I jumped through the rest of the presentation to discover the “five physical evidences” but only encountered “evidence” that was derived from dubious settled science like “red shift”…. This Diehold Foundation presentation is not to my taste. I couldn’t speak to whether or not the Diehold Foundation is on to something or not – way WAY above my pay grade. It’s just that this is the second time in less than a month I have heard about this “Gleissberg Cycle” and how it’s considered to be seven solar cycles and I was curious as to what was special about that particular number of solar cycles. But no worries – after a bit of googling the “why” doesn’t appear to be well understood. The ‘camera obscura’ was used as a calendar since pre 5200bce. The structure projected an image of the sun at sunrise onto a curved back wall in darkness. The image of the sun would then be seen safely, warts, black-spots and all. He is supposed to be a geologist. In addition ice pressure of 105 tons per square foot is obvious if one is between the ice and the ground – one definitely gets squashed, but the ice cannot then compress the ground underneath, so the hard pan is not the result of the ice cap bearing pressure on the ground. The only instance it might if the ground underneath is less dense than ice.